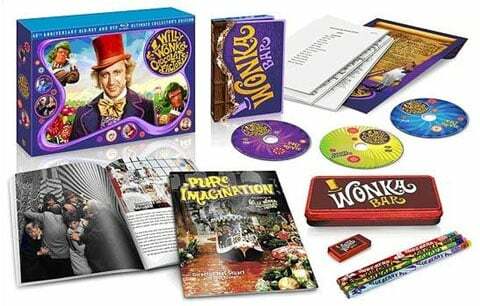 I’ve never seen a sweeter set in the world than Warner Home Video’s 40th Anniversary Edition of Willy Wonka and the Chocolate Factory. It looks like a board game with candy playing pieces and customized pencils for keeping score. It’s really a Blu-Ray/DVD combo set with a hell of a lot of quant, or gimmicky, or undeniably extraordinary extras. I want it and a golden goose, now! Unfortunately, I’ll have to wait until October 4, when the set streets. At $64.99, it runs pretty expensive, but the extras more than make up for the cost. The 40th Anniversary Edition of Willy Wonka will come in a limited edition tin with scented pencils and a special eraser. A 144 full-color photo booklet will also be an outside extra, but there are several new and old special features on the disc as well. Brand new featurettes include a segment on Roald Dahl and a second titled “Mel Stewarts Wonkavision.” Included as well are “Sing-a-longs,” “mouthwatering” interviews with the kiddie cast, and a documentary on Willy Wonka and the Chocolate Factory. To top off this parfait of a release, a golden ticket game piece will come with the set and can be used to win one of several prizes. The Grand Prize will be a Warner Bros. Studio tour, which is nice. However, the runner-up prize is a limited-run of the original film poster, which would look great on my wall and is just flippin’ cool. I can bribe my way into a studio tour another time. If you’re a scrooge of a movie purchaser, or just hate happiness and your kids still want a copy, a DVD edition will also be offered, with some scratch and sniff stickers. This will run a far more reasonable $12.97. Seriously though, it’s understandable if the gimmicky stuff isn’t up your alley and the DVD release looks best, but as far as a Blu-Ray release of the film goes, the 40th Anniversary Edition will only run you five bucks more than the inferior Blu-Ray book set that’s been out since 2009. If you’re going Blu with the title, keep that in mind.